Shown in photo with the Team is Stephan Carapiet - UAM CMS President, Tongchai Wongsawan - FMSCT President, Arnon ‘Turbo ‘ Theplib - Asian SX Champ, Mr. Paolo Martin of Honda Martin Racing and crew. 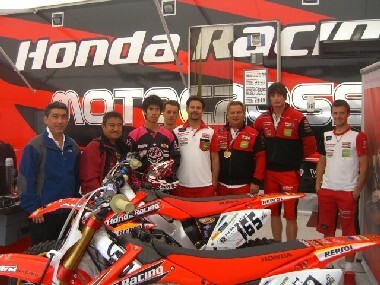 2006 UAM Asian Supercross Champion and winner of the first two Philippine rounds of the Asian SX Championships series Arnon Theplib from Thailand is shown here in photo during the 2007 British World Motocross Grand Prix held at Donington Park Circuit, UK held from August 24-25, 2007. His participation in this round of the World MX GP, as part of his privilege in topping the FIM UAM Asian Supercross Championships acquired this privilege thru the efforts of Youthstream, Honda Martin Italy and the UAM CMS.